Google announced a redesign of Gmail, which now includes the new Gmail confidential E-mail mode that allows users to set expiration dates for e-mails and prevent the forwarding, copying, downloading, or printing of e-mails. This redesigned Gmail feature prevents sending the confidential content directly; rather, recipients receive a link to the content that they can access with their Gmail account or via the web if they use another e-mail service. The use of links presents an opportunity for malicious cyber actors to mimic the e-mail message and phish unwary users. This feature is currently being introduced to select commercial users and will gradually be introduced to all users in time. 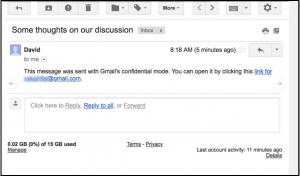 An example of a Gmail Confidential email message with a link is below. Example Gmail Confidential email message. As a best practice, any time an email is received with links, verify the link by hovering the mouse over the link. If the email is suspicious, call or text the sender. Do not email the sender. If the sender’s email has been compromised the hackers will respond.